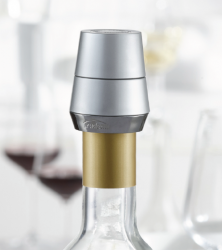 Easily seal and store your wine bottle with this great Expandable Wine Stopper! Wine stopper seals bottle and prevents wine from oxidizing with expandable rubber seal. Easier and better than re-corking. Allows for horizontal storing of open bottle.